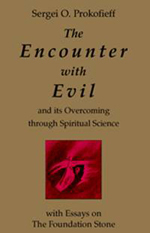 In our everyday lives, we are constantly challenged by the phenomenon of evil in all its many manifestations. But how can we cope with this seemingly eternal hindrance? In the first of these three essays, Sergei Prokofieff suggests that we start by developing a knowledge of the forces of evil in order to learn how they work in human evolution. Such knowledge is, in itself, the beginning of the process of overcoming evil. In order that members of the Anthroposophical Society might go further along this path, Rudolf Steiner gave them the spiritual 'Foundation Stone of the Good'. This Foundation Stone - which consists of light, imaginative form, and the substance of love - can live in our hearts and souls as a firm foundation for esoteric work, and a creative contribution towards the overcoming of evil. Ultimately it can lead us to a conscious experience of Christ in the etheric realm of the earth. In the second and third essays, Prokofieff examines further themes relating to the etheric advent of Christ, and its connection with the Foundation Stone of the Good. SERGEI O. PROKOFIEFF was born in Moscow in 1954, where he studied fine arts and painting at the Moscow School of Art. At an early age he came across the work of Rudolf Steiner and soon realised that his life was to be dedicated to the Christian path of esoteric knowledge. He wrote his first book, Rudolf Steiner and the Founding of the New Mysteries while living in Soviet Russia, and it was published in Germany in 1982. After the fall of Communism, he became a co-founder of the Anthroposophical Society in Russia. He currently works for the Society in Russia and as a writer and lecturer worldwide.